Designer’s note: The poncho sizes and measurements listed on this pattern aren’t absolutes, but rather guidelines for creating a fit. 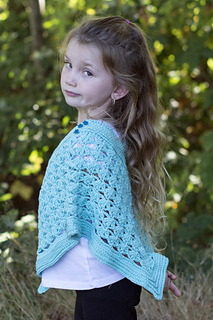 What is great about this pattern is that you can crochet the first 4-5 rows and then slip it over the head of the child you are making it for to check neck and shoulder fit at the start. 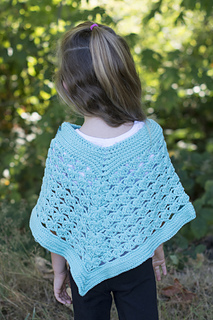 If you need more room for the top band of the poncho, go up to the larger stitch count size. If you need to go beyond the stitch counts as written on this pattern, please note that the starting stitch count needs to be a multiple of 5 that can be evenly divided by 4 (the next starting stitch count beyond what is written on the pattern would be 120). 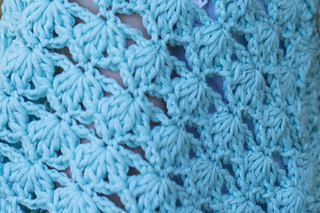 If you need to make the poncho longer in length, crochet several more rows of the shell stitch pattern to get the length you need (4 rows in pattern are approximately 2 inches). 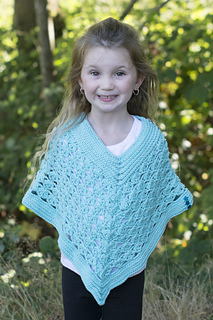 Knowing the basics of how you can adjust sizing at the start allows you to crochet this poncho in any size you need.